Is it just me or is there a direct correlation between sketchy venues and fabulous food. Food trucks, dive bars, whatever. Whenever there is some risk involved, the food tastes all that better. Kanomwan Thai Restaurant proves that theory right and doesn’t disappoint. Located in East Downtown on Telephone Road (and sometimes referred to as Telephone Thai), Kanomwan is nestled in the back of a shopping center that could really only be sketchy af. The restaurant is full of character and I highly recommend it. Their menu describes the restaurant as a place that “could easily become the new shrine for the first wave yuppie pilgrims.” Lol wut. I don’t know if I’m considered first wave yuppie given that this menu was probably printed mid-80s. But I’m a fan. The menu also boasts a quote from Houston City for Best Restaurant circa 1986: “They offer, all things considered-all things including, in some case, that visceral sensation, that frisson of knowing you are in the right place at the right time-good return for your dinging dollar. They will in all likelihood make you want to go back soon.” So philosophical. Such big words. Debating if they used visceral properly…. A Google Site Review sums the place up succinctly: “Modest but popular BYOB.” Which segues nicely into…BYOB. YES. Thai food and wine. All of the YES. 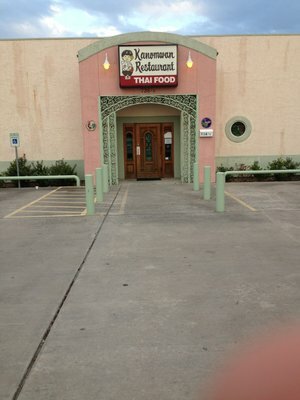 Tags: BYOB, East Downtown, houston, Kanomwan, pad thai, Thai, Thai food, thai tea. Bookmark the permalink.